Del-Nat Lawn & Garden Turf HF224 tires are specially designed to achieve maximum performance in outdoor, off-road conditions. The wide spaced footprint achieves higher flotation to protect sensitive soil from damage when machinery is in use. The block style, shallow depth studs achieve better traction than smooth patterns but prevent unnecessary digging. A studded shoulder on the HF224 handles uneven terrain without sacrificing grip and control. 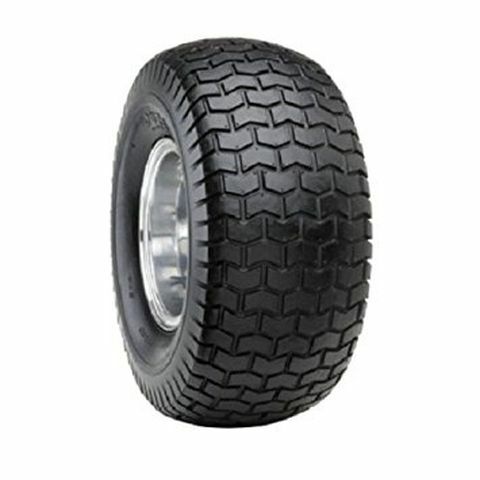 Made from reinforced rubber, the HF224 is a damage resistant tire that resists chunk and puncture damage from debris. 13/5.00--6 N/A N/A N/A N/A N/A N/A N/A 6"
Purchase includes the Del-Nat Lawn & Garden Turf HF224 tire only. The wheel rim shown in the picture is not included. Picture provided is a stock picture from the manufacturer and may or may not reflect the actual product being ordered. All Del-Nat Lawn & Garden Turf HF224 tires are continuously developing with manufactured improvements. With that said, Simple Tire and the manufacturers have the right to change these tire specifications at any time without notice or obligation. Please Note: Specifications of the Del-Nat Lawn & Garden Turf HF224 tires shown above are listed to be as accurate as possible based on the information provided to us by Del-Nat tires.